"It's all about nudging forward and challenging yourself while not forgetting who you are"
He may have originally came to our attention as a bass player, but there is much more to Placebo's Stefan Olsdal than meets the eye. What was the writing approach when it came to working on new material for Loud Like Love? "It's never just one way. We toured the last album for two years so there were times at soundcheck where things came out. Brian brought a few fully written songs to the mix and we had a few months in a rehearsal space where we bashed stuff out. "Doing that saves a lot of hassle. The more prepared you are going into the big expensive recording studio, the better. That way you can use time in the studio to your advantage and be a bit more experimental." And which big, expensive studio were you in? "We mainly recorded at RAK in London. It has an amazing drum sound in that studio. We've been going back there since [2006 album] Meds." How important is it to find a studio with a great drum room? "It's fundamental to the track. This is an old '70s studio and it shouldn't sound good, it's just a big open room with carpet on the wall but the drums sound sweet in there. You need a good drum sound, whereas amps and keyboards you can just put in a small booth and get a good sound." 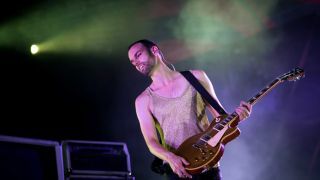 Placebo has always been a forward-thinking band in the studio, whether it be through your fuzz-heavy bass tone or layering keyboards on top of Brian's riffs. How did you push the boundaries this time? "It's a bit like a laboratory and you're trying to find new sounds. You're waiting for the magic moments and happy accidents. There's a piano that features quite heavily, we had some Asian instruments, we had the iPad. "We surrounded ourselves with tools old and new. I think the iPad on this record was used creatively and that wasn't there the last time we made a record. We had a lot of fun with that. An old guitar through an old amp is as valid to us as a 69p app on the iPad. "It's about the combination of all these sounds and every sound has its place. Ever since day one when Brian and I got together in a council flat in Deptford we had toy pianos and toy instruments and then placed those with more expensive instruments. We have always been interested in that." Were there any apps in particular that were used? "It was everything from a ZX Spectrum to the Animoog that just makes noise when you draw with your finger. It just keeps us from getting bored. Over the years we have become a six piece live because in the studio we outplay ourselves and have more layers than we can play on stage as the three of us." Is that one of the biggest challenges, avoiding boredom and keeping things fresh and inspired after 20 years and six albums? "For this record the hook that got me back in was when we all got together and wrote the title track. It's the track that got us all excited. If you want to pick a song apart and look at why it made me want to do this again, I couldn't tell you. "There is an identity to Placebo. It's all about nudging forward and challenging yourself while not forgetting who you are." Does that get more difficult as time goes on? "It gets more challenging, for sure. The larger body of work you have, the harder it is to justify to yourself that there is another record in you. If you persevere and work with the right people. Like our producer, Adam Noble - he gently pushed us out of our comfort zones. "It is a sensitive thing to let someone in that close to your music. We wanted to get the most from each track, sometimes that took a little blood and sweat and some tracks took a whole year to finish." Were you using your trusty Thunderbird and Ampeg rig in the studio? "The Gibson Thunderbird and Fender Jazz bass cover pretty much all areas for me. The Thunderbird is solid, heavy and tight and the Jazz is better for the slower tracks with more space in them. "I also stumbled upon an old Burns Bison bass. That is the heaviest instrument I've played, it weighed a ton but it is the closest in its bottom end to the Thunderbird. That bass brought life to a few tracks. I'm still using the Ampeg. I haven't found anything that will better it." You mention that live you go out as a six piece - is the band's use of layering keyboards and guitars a challenge for you as a bass player, to find your spot in the mix? "On some tracks there are three guitars going on, so the job is to find something that locks in with the drums and gives a solid foundation for those instruments to sit on top. "My tone has stayed pretty much the same, it is just tweaks on the low end here and there. The sweet spot is between being clean and overdriven and it has been that way since, god, since our fourth record, I think." "I consider myself just as much a guitar player as a bass player. I play guitar on the album, and on this album I will play more guitar live. I mainly used a Les Paul into a Marshall JCM 800 in the studio. "There was a Gretsch Falcon as well, and I bought a beautiful 1960s Epiphone Granada. It's one of the semi acoustic ones and it is so dynamic. If you just breathe on it it plays itself, and then if you play it hard it will overdrive. It's a very responsive guitar and it sounds very old so it really suited tracks with a bit more space like Hold On To Me." What kind of challenges does playing guitar, bass and piano on an album bring? "The challenge for me on this record was the piano player. I'm probably not above a grade four or five, the piano is the one instrument where I still get a bit of a sweat when the red light comes on!" Is it difficult to forge yourself a signature style as both a bassist and guitarist in the same band? And has finding those styles been key to the band's success? "Mine and Brian's styles differ a lot, he is much more gutsy, I'm more theoretically minded. That has always been a interesting combination of styles. "It's always a search for new combinations of guitars, amps and pedals. It doesn't matter how many distortion pedals you've got, there's always a cooler one out there." Which came first, guitar, bass or keys? "I started off playing drums! Then more out of vanity I was thinking if I was going to be in a band, I wanted to be in front of the drum kit! "Then I picked up bass and taught myself the theory of music, and from there I went to piano because I wanted to explore the harmonies of music, and why certain notes work better with some rather than others. "I then got into rock music and wanted to get my head around guitar. When I first joined Placebo I was on bass with us as a three piece, and gradually it started to move around." Bassist, guitarist, pianist, song writer - how did you end up juggling so many roles? "I never wanted to become a virtuoso on any instruments, I just wanted more tools to create music and write songs. Looking at someone like John Paul Jones, I admire him immensely for his playing and he is a string arranger and keyboard player. Some people want to get really good at one thing and that is also cool." Loud Like Love is out on September 16, and is available for pre-order from the official Placebo website now. You can also connect with the band on Twitter and Facebook.